We live in a conformist world. Where children are raised from birth to fit in. Where a person's ability to survive often depends upon his willingness to align his values with the oft-misled, misinformed, shockingly unfit masses. And where said masses? Well, they garner a HUGE amount of their lifestyle habits from one rather suspect source: TV. Allow no one to do it for you. Write down YOUR life purpose. It may conflict with that of others. Yet act on it daily. Sure, you may offend a few folks along way. I'd put money on it, in fact. As most have worked so hard to fit in. That they view anyone who DOESN'T as a threat to their comfort zone, their identity - even to their world view. Talk about indoctrinated! 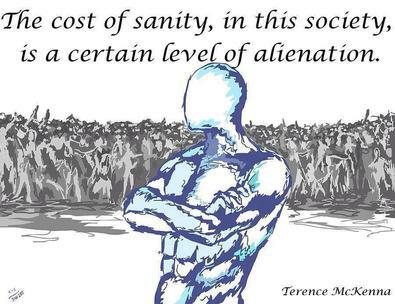 The cost of sanity in THIS society is a certain level of alienation. Take action in spite of it. Before trying this in the real world. Practice on social media. Which can be a good testing ground. To discover whether or not you TRULY believe in your chosen life path or purpose. Hint: You'll know you're on the right track. When you love what you do. When time stops while you're doing it. And when your work garners the odd rude comment or reply. Much more than you planned. P.S. Want to have a truly GREAT impact on humanity? Well, there's one best way to do it, I say. And that's to lead by example. Which is awfully tough to do if you're not physically fit. Solution: Read my shockingly inexpensive - yet highly valuable ebook - Confessions Of A Super-Fit Vegan. In which you'll learn to eat clean. Drop fat without counting calories. Build lean, attractive muscle from head to toe. And: Build a mental toughness that'll shock even you. Consult your doctor or licensed health-care practitioner before engaging in any diet or fitness plan. Use your common sense too, my friend. Which I've found: Rarely steers you wrong.